This summer is going to be super fun, as you get a lifetime chance of a luxurious rail trip on the Golden Chariot, that too at affordable prices. Karnataka Department of Tourism has announced a special summer package between the months of April and June 2017, to attract families to luxury train ‘The Golden Chariot’. The 2 Nights 1 Day package will run every weekend, starting on Friday evening (March 31) from Bengaluru and returning on Sunday (April 2) morning. The Golden Chariot summer special packages are available for two destinations in Karnataka – Mysuru and Hampi. Both train itineraries are aimed to offer the luxury and experience of Golden Chariot to Indian Tourists. It is the experience of luxury as well as exploring heritage sights at Mysuru and Hampi, at a very affordable price. The Mysuru Golden Chariot trip will cover destinations like Srirangapatna (summer palace of Tipu Sultan), Ranganathittu Bird Sanctuary, Jayalakshmi Vilas Palace, Amba Vilas Palace and Brindavan Gardens or Lalit Mahal Palace. The Hampi tour would cover the UNESCO World Heritage Sites such as Hemakuta Hill, Virupaksha Temple, Elephant Stables, Lotus Mahal Royal enclosure, Hazara Rama Temple, Queen’s Bath, Vijaya Vittala Temple Complex, Marvel Stone Chariot and the beautiful view of sunset at Tungabhadra River. Priced at Rs 30,000 per person, the train packages include food, accommodation, guide fees, entrance fees, cultural programs and curated/ guided sightseeing. This special tariff is only applicable for the summer vacation. Also, the tourists will be able to pick up the food of their choice from a large variety of cuisines. The summer special train packages is aimed at attracting families aboard the luxury train. The trains will depart from Bengaluru on Friday evening and return on Sunday morning. One train will proceed to Mysuru, while the other will go to Hampi. Both shall be back in Bengaluru city on Sunday morning. 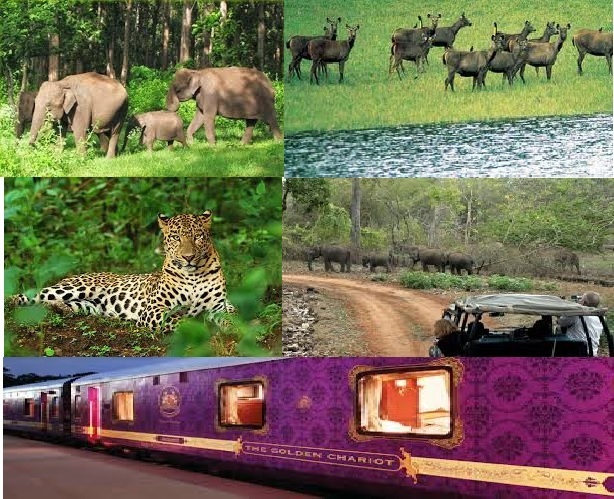 The Golden Chariot (TGC) is the first and only luxury train of Karnataka. One of the luxury trains of the world, it has fine facilities including 44 plush luxury cabins with LCD, TV, lockers, individual bathrooms, 24/7 attendant and guest amenities. The two restaurants on-board serve mouth-watering Indian and Continental cuisine. Gym, spa, steam room, business centre and host of other facilities are some features of the luxury train. This entry was posted in Train News. Bookmark the permalink. Wow!! Nice golden chariot summer offer. This is a very interesting post. Thanks for sharing that. © Copyright 2017 Indian Holiday Pvt. Ltd. All Rights Reserved.